At a party in high school, there was a guitar sitting there. I remember picking it up and trying to play. It sounded awful. My friend tried to teach me but neither of us had the patience. It wasn’t until University that I really got into it. This time it was different. I was surrounded by musicians so I was able to play along and get a feel for the instrument and just learn by watching them. I remember one time my friend was teaching me a couple new chords, I took the guitar and played it as close as I could… He said, “That works!” Those words were magic. I knew it wasn’t exactly what he played but he said it worked. I respected him, and his ear, a lot and so if it was good enough for him, it was good enough for me. I played that guitar at least 5 hours a day… and I’ll tell you that after a few months, I thought I sounded pretty good. It’s funny because I have lots of video of me playing throughout the years and every time I look back, I feel embarrassed for myself. I was thinking about it and had a bit of an epiphany. If the reason why I was inspired to continue is because I “thought” I was good enough… What if I thought I was bad? Well… I never really got into playing lead guitar… I became discouraged much quicker. 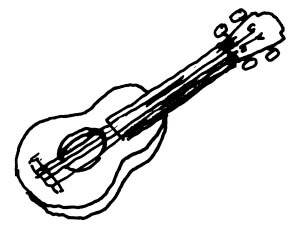 It is much harder to play individual notes than it is to strum chords. There are lots of “cheats” you can do while playing chords, and not a whole lot of wiggle room with playing lead. Think about the gap between what you think sounds good (taste) and what you can actually do (talent). When you think of it, if you have very specific taste, then it is going to take you a very long time to build the talent in order to satisfy that taste. I wonder if the people with the best ear are the ones who become discouraged faster? I’ve heard a term used by entrepreneurs… “Ignorance on fire is better than knowledge on ice”. I think the point of that quote is to say that it is better to do something than to do nothing. Sometimes people get so focused on being perfect that it paralyzes them. Learning an instrument is an excellent example of how not playing because you know what you “should” sound like is counter productive. Practice makes perfect. If you want to be good at something you must be willing to be bad at it for a while until you get better.